Task: To find a cost-effective vertical machining centre capable of significantly increasing output on oil and transmission pumps being machined from pressure aluminium die-castings. 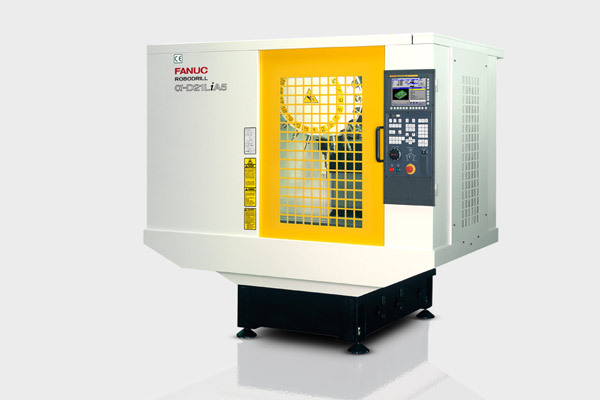 Solution: To set up a new production cell based on the FANUC Robodrill. Competitively priced and extremely well suited to the relatively light machining required, this 30 taper, high-speed, vertical spindle machine made an ideal choice. The customer was particularly impressed by the machine’s reputation for reliability. Result: Operating over three shifts, one Robodrill produces the oil pump cover and the other the pump body. A third Robodrill is devoted to producing two pairs of transmission pump components per cycle. To increase metal cutting capacity in response to an upturn in orders for automotive pumps, the UK’s leading manufacturer, Concentric, has installed three FANUC Robodrill machining centres at its manufacturing facility in Erdington, Birmingham. The company’s oil, water and fuel pumps are used mainly in diesel engines that power light to medium duty trucks and off-road plant. Two engine manufacturers have recently awarded significant new contracts to Concentric for machining, assembling and testing of an oil pump and a transmission pump. Consequently, a new production cell has been set up at the Erdington factory based around three α-D21LiA5 Robodrills dedicated to machining the aluminium pressure die castings. The norm at Concentric is to use 40-taper, horizontal machining centres with twin pallet changers. However, a 30-taper, high-speed, vertical-spindle machine was better suited to the relatively light machining operations and was significantly more productive and competitively priced. Concentric knew that the fourth axis arrangement on each machine would be critical to achieving the required TAKT times for the new oil pump and transmission pump. So the manufacturer approached Saluki in Leicester for the supply of bespoke fixtures to mount on the FANUC indexers, which had already been equipped with integrated hydraulics for clamping the parts and pneumatics for sensing that they are loaded correctly. FANUC also fitted a tool breakage detection device at one end of the trunnion to assist in avoiding the production of scrap in this large-volume manufacturing environment. "We researched machines for our new oil pump cell during the last quarter of 2013. For the metal cutting operations, we were looking for a smaller taper machine with a fixed table and a fourth axis in the form of a rotary indexer. We opted for Robodrills due to FANUC's good reputation in the market, especially for the reliability of their equipment. We went to see a similar machining centre that was robotically loaded at a manufacturer locally and the feedback was all positive. The Robodrill was also ideally sized in terms of its tool capacity, as our applications require 20 tools and the machine's turret-type magazine houses 21 cutters." To fulfil Concentric's customer contract, one Robodrill produces the oil pump cover and the other the pump body, with both machines operating over three shifts. In the first machine, the covers require two separate operations and are loaded two at a time into fixtures that accept the part in both orientations. One undergoes op 1 and the other op 2 during each cycle, so a complete cover comes out of the machine for every load / unload sequence. In the second machine, two bodies are fixtured and machined completely. For manufacture of the transmission pump, the third Robodrill produces two different parts in two operations each over a single shift, again from aluminium pressure die castings. Eight fixtures allow two of each part, ie four components, to be produced per load / unload. At the end of every cycle in all three machines, the trunnion carrying the fixtured components is programmed to come to rest at 45 degrees. It encourages swarf and coolant to fall away and minimises the need to use an air gun to clear the machining area. Additionally, work is presented more ergonomically to the operators, enhancing production efficiency. The high speed of the α-D21LiA5 Robodrills derives from an industry-leading specification that includes 1.5 g acceleration to 54 m/min rapids in all linear axes, up to 30 m/min programmable feed rates and 1.6 seconds tool change time, chip-to-chip. Working volume is 700 x 400 x 330 mm and the machines at Concentric have been equipped with a swarf conveyor and oil mist extraction. Mr McFall confirmed that the machines have proved reliable since installation, producing components to ± 10 microns tolerances, and that FANUC has provided excellent programming support and training.